Here are 1001 of the best illustrations assembled by the editors of Christianity Today's PreachingToday.com. 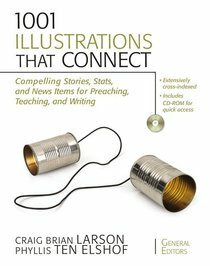 They're contemporary, proven, memorable, and illuminatingthese illustrations will preach! Furthermore, they're carefully arranged and indexed so it's easy to find the right one. An included CD-ROM makes getting the illustration into your sermon or lesson a breeze. ^^^Every preacher, teacher, or writer knows the value of a good illustration in helping connect the truth of the passage with the congregation or classand how hard it is to come up with good illustrations week after week. ^ ^ ^Of course the best illustrations are no good if you can't find the right one. These illustrations have been arranged according to twelve master topics, each divided into several subtopics. Further, they've been indexed according both to Bible references and to 500 keywords. A searchable CD-ROM is included, allowing you to get the illustration into your lesson or sermon with ease. About "1001 Illustrations That Connect (With Cd-rom)"
Craig Brian Larson is contributing editor for Leadership Journal and editor for their PreachingToday.com, an online journal and illustration service. He also pastors a church in Chicago. His books include Contemporary Illustrations for Preachers, Teachers, and Writers, Preaching that Connects, and The Art and Craft of Biblical Preaching. He and his family live in the Chicago suburbs. Customer Reviews For "1001 Illustrations That Connect (With Cd-rom)"
For its price I find the illustrations used in this book to be mostly cheesy and uninspiring. It does have a handy scripture and topical index to help with referencing. But the content in here are very disappointing, you will find more compelling illustrations online than in this massive but wanting book. I would be lucky to find 1 in every 10 illustrations useful.